Attack of the killer baby!!! Yes, this movie features a baby of a different kind...the kind that crawls and kills!!! Yes, a killer baby that for some reason me and my family watched quite a few times when I was a kid. Somewhat creepy and somewhat cheesy at the same time as parts of it are easily made fun of. The movie has a couple of kills in it, but it really is not all that gory compared to an Italian horror movie. 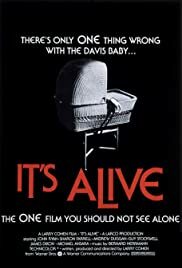 The story is okay and it does not try to explain things to much, unlike the later "It's Alive" movies would do. The movie ends in a rather different fashion too as it is somewhat surprising what the man does at the end. Still, the thought of a killer baby is kind of creepy and kind of funny and that is why this movie somewhat works. More gore and such would have made it better and more sewer scenes too, for some reason I find the sewer to be a very good horror backdrop that is used somewhat in movies, but not not enough for my tastes. All in all though this movie is not boring and somewhat fun to watch and in some parts make fun of.